Young ag seinm an phianó sa bhliain 1986. Is ceoltóir Ceanadach é Neil Percival Kenneth Robert Ragland Young, nó Neil Young de ghnáth a rugadh i dTorontó, Ontario, ar an 12 Samhain 1945. Is cumadóir, amhránaí agus ceoltóir cáiliúil é Young, agus ainm in airde aige ó thús a ghairme cheoil sna 1960idí go dtí an lá atá inniu ann. Tá saothar mór taifeadta agus eisithe ag Young le grúpaí ceoil éagsúla agus mar cheoltóir aonair. Tá an-mheas air mar cheoltóir, agus tionchar nach beag imeartha aige ar a lán ceoltóirí eile. Canann Young i nguth ard sainiúil, agus go bunúsach bíonn dhá phríomhsheánra le cloisteáil ina chuid oibre: ceol traidisiúnta suaimhneach ar thaobh amháin, agus rac-cheol ard agus salach ar an taobh eile. Chomh maith leis sin, tá triail bainte amach aige as go leor seánraí eile tríd na blianta. Bhain Young cáil amach ar dtús sna seascaidí mar bhall den bhanna Buffalo Springfield. Shroich Young a bhuaic, ámh, sna 1970idí nuair a chuaigh sé amach mar cheoltóir aonair leis na gceirníní After the Gold Rush agus Harvest. Chaith sé tamall freisin ina bhall den “shár-ghrúpa” Crosby, Stills, Nash and Young. Cé go raibh meas agus rath bainte amach aige ar fud an domhain, thosaigh sé ag éirí tuirseach leis an gceol tráchtála a bhí á sheinm aige. Dá bharr sin, thosaigh sé ag cumadh ceoil a bhí i bhfad níos trialaí, agus chaill sé a chonradh ceoil le Geffen sna 1980idí tar éis chúpla albam aisteach. Insealbhaíodh é sa Rock and Roll Hall of Fame faoi dhó: mar aonréadaí (1995) agus mar bhall den ghrúpa úd Buffalo Springfield (1997). Chuir sé faoi i dtuaisceart Chalfornia sna 1970idí mar a bhfuil sé ina chónaí go fóill. Níor éirigh sé as a shaoránacht Cheanadach riamh, áfach, agus tá sé aitheanta ag a thír dhúchais mar bhall de Ord Manitoba (mar ar chaith sé cuid mhaith dá oige) agus mar Oifigeach de chuid Ord Cheanada. Comhshaolaí agus gníomhaí ar son na síochána atá ann chomh maith. Rugadh Neil Young i dTorontó sa bhliain 1945, mac leis an úrscéalaí agus iriseoir spóirt Scott Young, agus a bhean chéile Rassy. Bhí roinnt cháile ar a athair mar scríbhneoir, agus bhí nóiméad sa spotsolas fiú ag a mháthair nuair a ghlac sí páirt i dtráth na gceist teilifíse i gCeanada. Bhí saol réasúnta compordach ag Young mar bhuachaill, in ainneoin go raibh roinnt fhadhbanna sláinte aige - fuair sé polaimiailíteas agus é sé bliana d'aois agus ansin titimeas ní ba dhéanaí. Ba sa mheánscoil a thosaigh Young ag casadh ceoil le daoine eile. Sheinn sé an giotár le bannaí rac-cheoil éagsúla i Winnipeg, mar shampla The Squires. Bhí singil mór áitiúil acu i Winnipeg ag am amháin, ach b'fhearr le Young a bheith ag seinm ina aonar sna clubanna traidisiúnta freisin. Bhuail sé le Stephen Stills ag an am seo, agus Joni Mitchell, ar Cheanadach í féin freisin. Sa bhliain 1966, d'fhág Young a bhanna agus a gcairde, agus thiomáin sé go dtí Los Angeles, in eileatram a cheannaigh sé agus ar ar thug sé Mort. I gCalifornia dó, bhuail sé le Stills arís, agus chuir siad grúpa nua le chéile in éineacht le Bruce Palmer agus an t-amhránaí Richie Furay. An t-ainm a thugadar air ná Buffalo Springfield, agus bhí stíl cheoil a bhí áit éigin idir ceol traidisiúnta, rac-cheol agus ceol tíre. Bhain Buffalo Springfield lucht tacaíochta amach ar an toirt, agus d'éirigh siad go maith leis an gcéad albam a scaoil siad - Buffalo Springfield, leis an singil “For What It’s Worth” a bhí cumtha ag Stills. Níorbh fhada gur thosaigh teannas ag fás idir Stills agus Young, príomhchumadóirí an bhanna, rud a tháinig chun solais go tapaidh nuair a chuaigh siad ar ais sa stiúideo chun an dara halbam a dhéanamh. Thosaigh Young ag caitheamh an chuid ba mhó dá ama amach ag seinm le daoine eile, nó ina aonar. Lean sé leis an obair áfach, agus tháinig an t-albam nua, Buffalo Springfield Again amach sa bhliain 1967, le cúpla sár-amhráin ó pheann Young. Bhí rath ag an albam arís, ach bhí sé socraithe i meon Young go raibh sé críochnaithe leo mar bhanna. Sa bhliain 1968, scar siad go hoifigiúil. Bhí Young i bhfad níos compordaí i gcónaí ag obair ina aonar. Bhí a stíl áirithe féin aige, ceann a bhí deacair dó a chuir ar éinne eile. Bhí a lán muinín aige ina chuid cheoil féin, agus ní raibh tacaíocht nó cabhair uaidh mar chumadóir. Scríobh agus thaifead sé cúpla rian leis an léiritheoir Jack Nitzche, fear amháin a bhí in ann é smaointí Young a thuiscint. Shínigh Young conradh nua leis an mbainisteoir Elliot Roberts, duine a bhíodh ag obair le Joni Mitchell freisin. 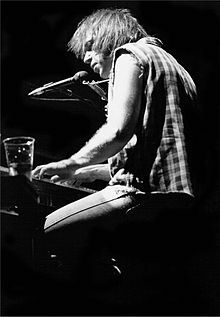 Níor chuir Young agus Nitzche am ar bith amú, agus isteach leo gan mhoill sa stiúideo chun tús a chuir leis an obair ar chéad cheirnín aonair Young, Neil Young a seoladh amach sa bhliain 1969. Bhí ábhar an albaim cosúil leis na rudaí a rinne sé le Buffalo Springfield, agus bhí rath nár bheag aige. Bhí Young socraithe síos anois mar cheoltóir aonair, ach chonaic sé gá fós grúpa éigin a fháil chun fuaim níos troime a thabhairt isteach sna rianta. Bhuail sé leis The Rockets don chéad uair i gCalifornia, banna beag a bhí tar éis a gceirnín féin a sheoladh sa bhliain 1968. Banna guthach den scoth a bhí ann, ach ní raibh siad in ann uirlis ar bith a sheinm. Níor chuir an rud seo as aisling Young ar chor ar bith, cé go raibh siad go dona fós fiú mar cheoltóirí nuair a bhí na huirlisí foghlamtha acu. Bhí Young an-tógtha leis an smaoineamh, mar bhí seisean den tuairim gur chuir an rud seo go mór le íonacht agus paisean an bhanna. Ina theannta sin, b'amhránaithe cearta iad, rud a bhí an-luachmhar agus iad ag seinm go beo. Bhunaigh Young an banna nua as baill The Rockets—Danny Whitten ar an ngiotár, Billy Talbot ar an ndordghiotár agus Ralph Molina ar na drumaí—ar a bhaist sé Crazy Horse, ón té stairiúil leis an ainm céanna. Thaifead siad albam lán nua taobh istigh de choicís, Everybody Knows This Is Nowhere, leis na hamhráin cháiliúla "Cowgirl in the Sand" agus "Down by the River". Ba thoradh an-mhaith é, agus bhí Young an-sásta leis. Neil Young sa bhliain 1970. Ag an am sin, bhí grúpa nua curtha le chéile ag a sheanchara Stephen Stills - Crosby, Stills agus Nash - le David Crosby ó The Byrds agus an ceoltóir Sasanach Graham Nash ó The Hollies. Saghas sár-ghrúpa a bhí ann, ina raibh triúr de na ceoltóirí ba rathúla sna laethanta seo. D'aontaigh Young áit a ghlacadh sa ghrúpa, agus cuireadh a shloinne isteach in ainm an bhanna. I rith na bliana dár gcionn, sheinn siad le chéile ag Woodstock, agus d'eisigh siad na halbaim Déjà Vu sa bhliain 1970 agus Four Way Street sa bhliain 1971. D'fhill Young ar ais ar Crazy Horse, chun ceann dá cheirníní is fearr a dhéanamh, After the Gold Rush sa bhliain 1970. Rath tráchtála mór a bhí ann, mar bhí ainm Young in airde fós tar éis a chuid oibre le CSNY. Scaoil sé an singil mór Only Love Can Break Your Heart. Bhí Crazy Horse tar éis a gconradh ceoil féin a fháil, agus chuaigh Young ag lorg ceoltóirí nua chun an chéad cheirnín eile a dhéanamh. Bhailigh sé roinnt ceoltóirí tíre le chéile, agus bhaist sé an t-ainm The Stray Gators orthu. Rinne siad an t-albam úd Harvest, agus bhí cáil mhór air arís. Chuaigh an rian Heart of Gold go barr na gcairteacha i SAM. Tar éis na mblianta fada a bhí caite aige gan mórán ratha, áfach, ní raibh Young réidh a bheith ina dhuine cáiliúil. Mar thoradh, dhiúltaigh sé an aire a fuair sé. Sna luath 1970idí chas Young le Carrie Snodgress, banaisteoir Meiriceánach, agus chuaigh sí a chónaí leis. Ar 8 Meán Fómhair 1972, rugadh mac leo. Rugadh Zeke, mar a thug siad air, le pairilis cheirbreach. Scar Young agus Snodgress sa bhliain 1975. Lean Young ar aghaidh ag obair ar albam nua le Crazy Horse, Time Fades Away. I gceann tamaill, chuir sé Danny Whitten amach as an bhanna, mar bhí andúil héaróne aige, agus ní raibh sé ábalta seinm i gceart. Go díreach tar éis seo, thóg Whitten ródháileog, agus fuair sé bás ar an 18 Samhain 1972. Ba mhór an tubaiste a bhí ann do Young. Thosaigh Young banna nua arís darbh ainm The Santa Monica Flyers, go bunúsach ceoltóirí as Crazy Horse le Nils Lofgren ag seinm an ghiotáir. Tréimhse deacair a bhí ann do Young, agus mar thoradh bhí an t-albam a rinne siad, Tonight’s the Night, an-salach agus an-challánach. Ní raibh an comhlacht ceoil sásta leis in aon chor, agus níor sheol siad é amach ar feadh dhá bhliain. Ní raibh an t-albam an-rathúil, ach ba cheirnín suimiúil é a bhí beagnach cosúil le punc-rac, rud a bheadh coitianta ní ba dhéanaí. Seoladh an t-albam On the Beach sa bhliain 1974. Chun albam nua a dhéanamh, chuir Young Crazy Horse ar ais le chéile agus thaifead siad Zuma, ceirnín rac-cheoil. Thóg Frank Sampedro áit Danny Whitten ar an giotár. Chuaigh Young ar ais le chéile leis a sheanchara, nó namhaid b’fhéidir, Stephen Stills. Rinne siad an t-albam Long May You Run le chéile, ach d’fhág Young arís i lár an thurais. Sa bhliain 1976, sheinn Young le The Band, Joni Mitchell agus daoine eile ag an gceolchoirm mór The Last Waltze. Rinne Martin Scorcese scannán den cheolchoirm, agus sular scaoileadh bhí air obair na gcapall a dhéanamh chun píosa cócaon a bhí le feiceáil i srón Young a bhaint amach. Bhí Young ar ais i mbéal an phobail sa bhliain 1977 le American Stars’n’Bars, ceol tíre arís agus cosúil le Harvest, agus Comes a Time sa bhliain 1978. Chuaigh Young i dtreo nua ar an gcamchuairt Rust Never Sleeps - sheinn sé leath den seó le Crazy Horse agus an leath eile ina aonar le giotár fuaimiúil. Bhí punc-rac ag briseadh amach ag an am céanna, ach bhí Young ar dhuine den lucht beag de cheoltóirí a bhí in ann é a thuiscint, agus a stíl a athrú. Luaigh Young ainm Johnny Rotten san amhrán ba mhó dá chuid ag an am Hey Hey, My My (Into the Black), rud a spreag Rotten chun amhrán de chuid Young a roghnú ar chlár raidió i Londain. Chuir Young amach na halbaim Rust Never Sleeps agus Live Rust, agus léirigh sé an scannán Rust Never Sleeps, faoin ainm cleite Bernard Shakey (is ainm cleite é Shakey a úsáideann Young go minic). Sna 1970idí a casadh Pegi Morton air, agus sa bhliain 1978 phós siad. Bhí Young gnóthach fós sna 1980idí, ach ní raibh mórán ratha aige leis na halbaim Hawks & Doves agus Re-ac-tor. Tar éis sin, chuaigh sé i dtreo ceoil nua arís, ceann a bhí an-trialach agus aisteach. An t-albam is trialaí a tháinig uaidh ná Trans, seolta sa bhliain 1982. Ceol leictreonach a bhí ann, ag baint feidhm as éifeachtaí agus an teicneolaíocht nua. Chuir Young suim mhór i gcúrsaí teicneolaíochta, ní amháin ina chuid ceoil, agus ina shaol pearsanta chomh maith, agus é ag iarraidh cabhair a thabhairt dá mhac Ben, a rugadh le pairilis cheirbreach freisin. Bhunaigh Neil agus Pegi Young an Bridge School sa bhliain 1986 chun chuidiú le Ben agus páistí eile. Rugadh iníon dóibh freisin, Amber Jean, a raibh titimeas uirthi, mar atá ar Neil chomh maith. Young ag seinm sa Spáinn. Tháinig Young ar ais i bhfaisean go tobann sna 1990idí. Chuir sé amach rac-albam nua Ragged Glory le Crazy Horse, agus chas sé le cúpla banna a bhí ag éirí rathúil ag an am, mar shampla Sonic Youth agus Soundgarden. Bhí Young luaite mar thionchar mór ar a gcuid ceoil ag roinnt ceoltóirí grúinse, mar thoradh thosaigh na meáin ag tabhairt "Athair baistí an ghrúinse" ar Young. Nuair a chuir ceannaire Nirvana Kurt Cobain lámh ina bhás féin sa bhliain 1994, chuir sé líne ó amhrán Young ina nóta féinmharaithe "It's better to burn out than to fade away". Thosaigh Young cairdeas freisin leis na grúinseoirí mór le rá eile Pearl Jam, agus sheinn siad le chéile ar MTV. Mar thoradh, chuaigh ceol Young i bhfeidhm arís ar an nglúin óg. Chuaigh Pearl Jam isteach sa stiúideo leis chun an ceirnín Merkinball a dhéanamh, agus chuadar amach le chéile ar chamchuairt domhanda. Ina dhiaidh sin, sheol Young albam nua a bhain rath mór amach arís, Harvest Moon, agus sheinn sé ar MTV Unplugged. Rinne an stiúrthóir scannán Jim Jarmusch scannán faisnéise dar teideal The Year of the Horse le Neil Young. Bhí an scannán faisnéise bunaithe ar thuras 1996 le Neil Young agus Crazy Horse. Sa bhliain 1998 chuaigh Young ar an ardán le Phish ag Farm Aid agus ansin arís ag ceolchoirm ar son an Bridge School. Sa bhliain 1999, tháinig Young agus Crosby, Stills and Nash le chéile arís i gcomhar turas sna Stáit Aontaithe agus Ceanada a thug isteach $42.1 milliún dollar. Tréimhse bisiúil a bhí sna deich mblianta a tháinig i ndiaidh na nóchaidí. Blianta gníomhúla ó thaobh na polaitíochta agus an imshaoil iad chomh maith. Tháinig roinnt albam nua amach in éineacht le scannáin a rinneadh de na ceolchoirmeacha a ghabh leo, mar shampla na halbaim Silver & Gold agus Road Rock Vol. 1 (albam beo) a scaoileadh sa bhliain 2000. In onóir na n-íospartach in ionsaithe 9/11 a scríobh agus a chas sé “Let’s Roll”, amhrán singil a dhéanann an teideal tagairt do na paisinéirí agus criú a sheas i gcoinne fuadaitheoirí Al-Qaeda ar Eitilt 93. Cuireadh “Let’s Roll” isteach in Are You Passionate?, albam amhrán grá sa chuid is mó, a rinne sé le Pegi, a bhean chéile, agus an banna Booker T. & the M.G.s. Chas Young “Imagine”, amhrán de chuid John Lennon, ag an gceolchoirm America: A Tribute to Heroes agus, in éineacht le Eddie Vedder and Mike McCready, “Long Road”, amhrán de chuid Pearl Jam. I mí Márta na bliana 2005, fuair na dochtúirí ainéaras in inchinn Young. Ar 29 Márta, i Nua-Eabhrac, d’éirigh leo é a chóireáil le máinliacht íosionrach, ach dhá lá ina dhiaidh sin thit sé i laige i sráid i Nua-Eabhrac de bharr fuiliú ó artaire ar bhain na dochtúirí feidhm as chun an t-ainéaras a shroichint. Tar éis rátha, bhí sé ar an stáitse arís, ach tá an ghéarchéim sin le feiceáil sa mhachnamh ar an mbás agus san inbhreithniú ginearálta ina albam "Prairie Wind", a tháinig amach i mí Márta, 2005. Scaoileadh scannán an bhliain ina dhiaidh sin a rinne Jonathan Demme de Young ag cur an albaim i láthair ar an stáitse den chéad uair in Nashville. "Neil Young: Heart of Gold" teideal an albaim úd. Sa bhliain 2006, agus an cogadh san Iaráic faoi lán seoil, scaoil Young albam nua dar theideal Living With War, rud a chuir sé le chéile go tapa agus inar cháin sé polasaithe cogaidh an Uachtaráin George W. Bush de bharr an chostais dhaonna an chogaidh ar na saighdiúirí, a muintir agus sibhialtaigh. Chas sé na hamhráin nua ar an Freedom of Speech Tour '06, turas a rinne sé mar bhall de Crosby, Stills, Nash & Young. Fuair sé idir fháilte agus cháineadh óna lucht éisteachta. Bhí áit sna hamhráin ar an albam sin dá dhearcadh ar an timpeallacht freisin agus sa bhliain 2007 chuir sé amach albam, Chrome Dreams II, ina léirigh na líricí a chuid smaointe ar an ábhar céanna. Lean Young leis na ceolchoirmeacha Farm Aid mar sheinnteoir agus amhránaí, agus mar bhall de bhord stiúrthóirí Farm Aid, ceann de na sraitheanna ceolchoirmeacha carthanacha is fadtéarmaí dá bhfuil ann agus $43 milliún bailithe acu ón mbliain 1985 i leith chun cuidiú le feirmeoirí beaga. Sna 2010idí rinne Neil Young comhoibriú arís le Crazy Horse. I measc na dtaifeadán a rinne sé leo bhí an t-albam úd Americana, an chéad cheann dá chuid nach raibh ann ach amhráin a chum daoine eile. Thug Young ómós in Americana d’iomainn náisiúnta neamhoifigiúla agus a leithéid, mar shampla "This Land Is Your Land" óna Stáit Aontaithe, "Clementine" amhrán na nArcádach ó Alba Nua a chuir fúthu i Louisiana, agus "God Save the Queen", amhrán a chas Young gach lá ar scoil i gCeanada. Comhoibriú eile le Crazy Horse ná leagan lán-ghrúinse de "I Saw Her Standing There" de chuid na Beatles ar ócáid dhinnéar MusiCares Person of the Year in ónóir do Paul McCartney ar 10 Feabhra 2012 i Hollywood. Sa bhliain 1988 d'fhógair Young tionscadal chun gach píosa ceoil dá chuid a chruinniú, a athmhaistriú má ba ghá, agus a chur ar fáil don saol. Níor eisíodh an chéad díolaim, áfach, ach sa bhliain 2009, mar atá The Archives, Vol. 1, 1963–1972. Tá roinnt sraitheanna taifeadán sa chartlann: boscraí i gcúig imleabhar, sraith cheolchoirmeacha (12 imleabhar), agus sraith eisiúintí oifigiúla (14 imleabhar). Chomh maith leis an gcartlann féin, tá sraith sárshaothar digiteach ann chomh maith a eisíodh mar dhlúthdhioscaí sa bhliain 2003 agus a cuireadh ar fáil ní ba dhéanaí mar HDCD. Tá sraith eagrán speisialta ceaptha chomh maith (Special Edition Series): eisíodh albam amháin sa tsraith sin go dtí seo, Toast (2000), taifeadadh beo ná scaoileadh ariamh roimhe sin. Tá cónaí ar Neil Young ar rainse in aice le La Honda, California, ar a dtugtar Broken Arrow i ndiaidh amhrán de chuid Buffalo Springfield. Chuir Young tús leis an rainse sa bhliain 1970 le 140 acra a cheannaigh sé ar $350,000. Tá sé ag cur leis ó shin i leith agus inniu tá roinnt míle acra ann. "Bailitheoir" a thugann Young air féin ag tagairt dá bhailiúcháin carranna (35 ceann díobh aige tráth), mionsamhlacha de thraenacha, cáipéisí, srl. Deir sé gur sin an chúis lena thionscadal cartlainne freisin. Is comhshaolaí aitheanta Neil Young agus suim láidir aige i bhfeithiclí leictreacha. Gníomhaí síochána é freisin. Chuir sé ceolchoirmeacha bliantúla ar bun darb ainm FarmAid chun cuidiú le feirmeoirí beaga. Rinne sé ceolchoirm faoi leith sa bhliain 2001 i gcuimhne íospartaigh 9/11. Ar an 14 Lúnasa 2014 chomhadaigh Neil Young achainí i gcúirt ag iarraidh colscaradh idir é féin agus a bhean chéile, Pegi. Young ag seinm sa bhliain 2006. Young, Neil; Mazzeo, James (2004). Greendale. Londain: Sanctuary. ISBN 1-86074-622-5. OCLC 57247591. Young, Neil (2014). Special Deluxe: A Memoir of Life & Cars. Nua-Eabhrac: Blue Rider Press (Random House). ISBN 978-0399172083. ↑ "Resurrection of Neil Young, Continued". Time. ↑ "Neil Young treated for 'dangerous' aneurysm". ↑ Young, Neil. Waging Heavy Peace, lgh. 6, 222–223. Blue Rider Press, Nua-Eabhrac, 2012. ↑  Rolling Stone, 26 Lúnasa 2014 (arna rochtain ar 15 Bealtaine 2015). Tugadh an leathanach seo cothrom le dáta an 27 Samhain 2017 ag 12:00.